I was on my way to the Inyo Mountains for a rendevous with friends to climb a few obscure peaks along with Winnedumah Paiute Monument, driving through Yosemite with an extra day to get some hiking in on my own. 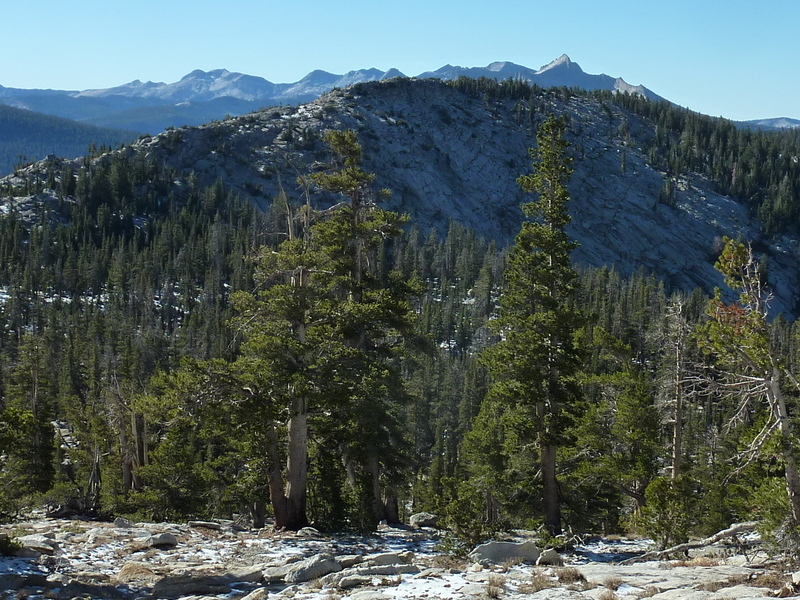 I decided to do a loop south of Tenaya Lake to visit Sunrise Mtn and a few nearby unnamed peaks. I had spent a cold Oct night sleeping at the Sunrise TH, half expecting to be roused in the middle of the night by park rangers as mine was the only car there when I pulled in after midnight. I was surprised to find a handful of other cars parked there when I awoke sometime before 7a - I hadn't realized that it was a semi-popular TH to use in the early morning for a hike to Clouds Rest to catch sunrise. Cold as it was when I started out (mid 30s), it would warm nicely into the 50s before I was done around noon. I followed the Sunrise Trail south as it climbs 1,000ft to a saddle at the 9,200-foot level and a trail junction. The right fork heads to Clouds Rest while the left fork I followed travels through Sunrise Lakes before making its way to the Sunrise High Sierra Camp on the south side of Sunrise Mtn. Where the trail goes over its highest point at 9,700ft, before descending to the camp, I turned left to head cross-country over easy terrain to the summit ridgeline of Sunrise Mtn. The area had seen a dusting of snow a few days earlier which still hung about the shady areas and higher elevations. It wasn't enough to be of any hindrance, but rather added some contrast to the scene to bring out more details in photos. I found myself at the highpoint towards the north end of the ridge shortly after 9a with fine views unobstructed by trees. The best view was of the Cathedral Range features to the northeast centered around Echo Ridge, some of the finest scrambling to be had in Yosemite and the Sierra. I continued north along the ridge, descending its north side over easy, open granite slabs that characterized much of today's cross-country - no real difficulties, just enjoyable rambling in stunning scenery. 30min later I had covered the mile distance to Peak 10,151ft to the north, halfway between Sunrise and Tenaya. Looking southwest, Half Dome can be seen in profile to the right of the pointed Clouds Rest. Another half hour further north found me to the summit of Peak 10,340ft to the northeast of Tenaya Peak. The topo map shows an extra contour on this unnamed summit in relation to Tenaya, but looking over it was impossible to definitively say that one was higher than the other. Both summits offer great views of Tenaya Lake and across Northern Yosemite. There was a surprising amount of snow coverage traversing between the two for the 15min it took to get from one to the other, though none of it more than an inch or two deep. It was my fourth visit to Tenaya Peak. The first three visits were all in 2003 when I was taken by the easy class 5 route on its NW Buttress route and came back to repeat it as an unroped climb. I had intended to descend the south side of Tenaya Peak to Mildred Lake and then west back to the Sunrise Trail, going as far as finding a use trail to facilitate the descent off that side. I lost the trail somewhere along the way not long after finding it and eventually found my curiosity leading me around to the slabby SW Ridge which seemed more interesting. On the fly I decided to continue following this ridge as it curves north, dropping towards Tenaya Lake. Some of this was easy class 3, for the most part fairly enjoyable with great views of the lake. The ridge drops away into a steep, forested slope for the last 300ft or so, much more fun going down than up, eventually dumping me onto the loop trail circumnavigating the lake. From here it was less than a mile back to the Sunrise Trail and TH where I arrived at 11:30a. I found the parking lot absolutely packed at this time, surprising for a Friday in October. Two park rangers occupied the middle of the lot in conversation from one cruiser to the other. Someone seemed quite appreciative to get my spot when I pulled out a few minutes later. Anyone driving on US395 just south of June Lake Junction can hardly fail to notice a striking pile of volcanic rubble on the west side of the highway. Decently-sized trees grow from the boulder jumble seemingly without soil to support them, but for the most part it's another aborted volcanic episode in the Mammoth area. It's called Wilson Butte and I've thought for years about climbing the thing. I had some spare time after driving through Tuolumne Meadows and over Tioga Pass on my way to Bishop, taking an hour to see what it had to offer. Not a whole lot, it turns out, but enough to keep me somewhat entertained for an hour. I parked just north of the feature off the side of the highway and started from there. Up close it looks much the same as at 75mph on a driveby - a pile of rocks. Loose, too, making for tedious going both up and down. I climbed the initial wall on the north side into what might pass as a crater but looked more like a wave of rolling boulder piles. A coyote napping among the rocks was as surprised to see me as I him, and took off with only a few glances over his shoulder giving me a look of, "Why are YOU here?" The highpoint wasn't immediately obvious as I climbed the first of several likely candidates before I zeroed in on the highest to the southeast of the others. This highest point had some large trees almost crowding the summit - "How do they survive up here?" I wondered. For one, they seem almost immune to the periodic fires that sweep across the Deadman Summit area, the surrounding rock insulating them from their brethren lower down. After tagging another point to the north almost as high, I was satisfied with calling this one done and headed back down.